Leaks are inevitable, especially on large commercial buildings. Flat roofs are notoriously prone to leakage and often experience structural damage if the affected areas aren’t treated quickly. At New View Roofing, it is our goal to detect small leaks before they develop into worsening problems, and preventively stop new ones from forming. We achieve this through a variety of proven methods. Damage caused by leaks can range anywhere from minor water stains and electrical shortages to total structural failure of the roof. We want to avoid this at all costs. Due to advances in leak detection technology, our roofing contractors are expertly trained in the latest practices to treat existing leaks and stop new ones. We use effective leak-testing methods, including electronic infrared thermal technology. This can detect even the smallest breaches in a roof membrane, allowing our team to rapidly repair leaks well before they cause structural damage. Because most commercial properties have flat roofs as opposed to sloped, water cannot drain off as easily. This often leads to a collection of water that seeps past shingle layers and into the interior of the facility. 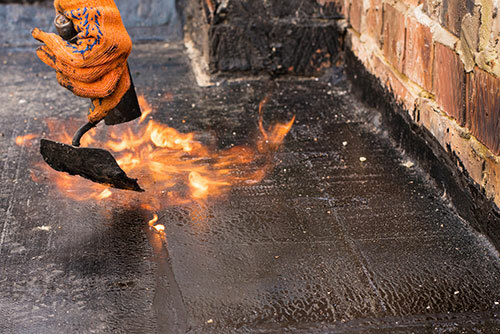 New View Roofing, however, offers a simple solution with our waterproofing services. With waterproofing roof coatings, we can add a durable barrier to the roof membrane that prevents water from entering through the surface. Waterproofing your commercial roof also insulates the material and prevents energy loss. New View Roofing is a full-service roofing contractor. In addition to our preventive roof maintenance, leak detection, roof coatings and waterproofing services, we also specialize in the installation, repair and inspection of commercial roofs. Our roofing contractors are highly trained and equipped to handle any roofing project – no matter the scope. Call (469) 232-7220 to schedule your free inspection, or fill out our online form.